SURPRISE! LD Freebie: Bicycle Craze GRAPHIC set plus more! Hurry up and click here or the image above to add the Bicycle Craze GRAPHIC set to your cart. Check out and pay $0! While you're there, get the Balloon Festival Graphic Set and paper pack, and Cycle Course alpha for 50% off. Better grab your freebie and sale sets FAST because these offers will expire at midnight tomorrow! My Lettering Delights Gallery Updated! I finally found some time to update my gallery. If you have not taken a look at it recently, do click here or the picture below to check out my work done with Lettering Delights' SVGs, graphics, fonts, and doodlebats. 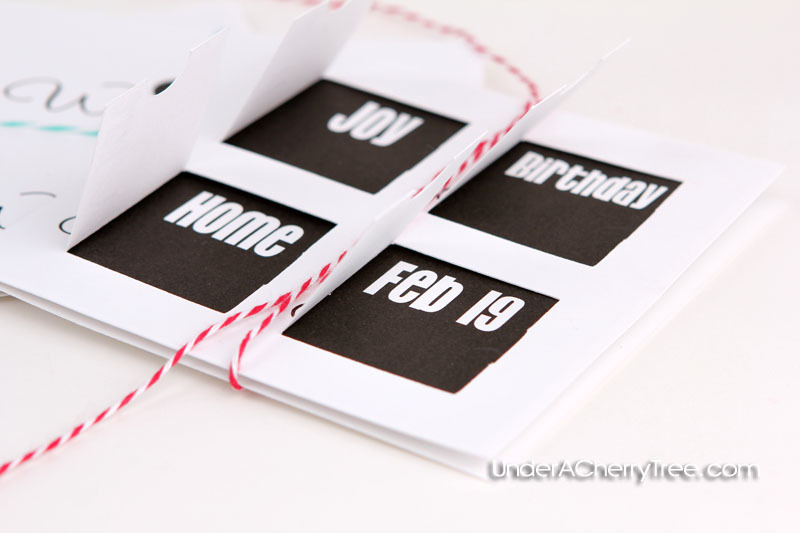 There are over 100 cards and projects listed on one page and clicking on the picture of the card/project will bring you to the blog post that corresponds to it. SUPER AWESOME Bundle for the New SVG user! If you are new to Lettering Delights or if you are a new user of their SVGs, you MUST get this deal! Lettering Delights is offering a SUPER bundle of over 1400 images for only $100. Over 1400 images! You will get 100 SVGs sets which means that each set is only $1. One Dollar! If you have made a recent purchase from Lettering Delights, check your confirmation email because you may find a 25% coupon that you can probably apply to this sale too! If you don't already have many of their SVG sets, this is a great time to get them. Better mark your calendar for next Wednesday and Thursday because this sale is only available on March 2 and March 3. Don't miss out on this great deal because who knows when it will come back again. LD Friday Freebie: Glam Girl's Purse SVG! Have you heard that Lettering Delights is having a special Facebook-only promotion for the next 12 days? Eveyday, they will offer a special deal or discount that will be good for only 24 hours. The exception is the Friday Freebie which will be free for the weekend. Today's Friday Freebie is a Glam Girl's Purse SVG and the first deal that kicks off the 12-day FB promotion is a 50% discount on over 30 girly graphic sets, including the Glam Girl's Paper Doll Graphic Set**! Click here to start shopping and click on the image above to download your free purse SVG! **Please note the difference between the Graphic Set and the SVG set. 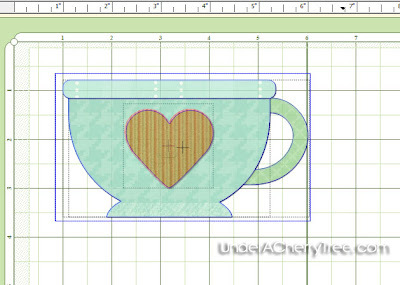 If you are buying to use for cutting with your electronic cutter, I would recommend that you purchase the SVG file instead of the graphic set. It's been a while since I last made a Print-and-Cut (PNC) card. To be exact, the last PNC card that I posted was this Thanksgiving card that I made back in November 2010. I chuckle when I think of my earlier PNC cards. 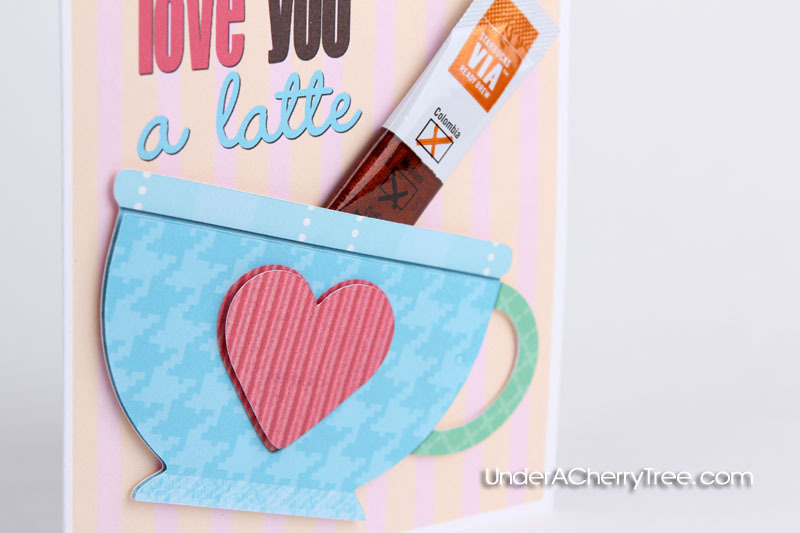 I was pretty annoyed by the concept of the Cricut Imagine and the hype that surrounded it that I decided to make a whole bunch of PNC-type cards (Faux-magine? LOL!) without the Imagine. Once I got the cards out of my system, and I was satisfied that I didn't need nor want the Imagine, I stopped making PNC cards. Cards that are partially printed are pretty to look at but they are not really my thing. 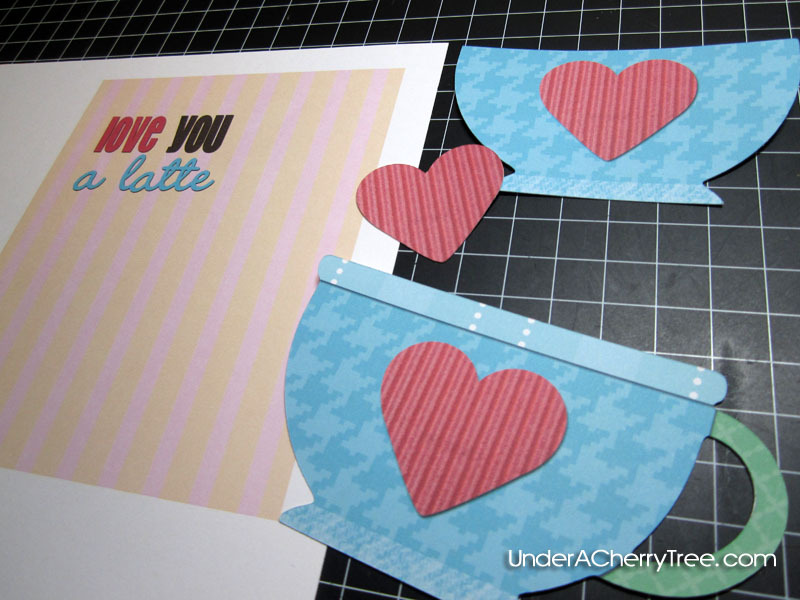 I really prefer making the traditional paper-pieced cards. The release of Make-the-Cut v.3.0 last November included a Print capability. Kay of CleverSomeday made this quick video to illustrate the concept of PNC using Make-the-Cut. There are many ways to do a PNC card with Make-the-Cut. From my low-tech double-sided tape method, to Kay's Hinge method, to the cutting on color blocks method, MTC's print capability has allowed us to create PNC cards not only without the Imagine but it has also enabled us to do so without any other software that has a print capability (like Adobe Photoshop). Today's card was made using a new and exciting technique of PNC. Instead of pixel-tracing a textured graphic and creating the layers from it, I combined the graphic image with it's SVG version. In other words, I brought the texture onto the mat and stacked the SVG version over that texture. For this card, I brought in the GRAPHIC image of the cup (from LD's Sweet Nothings GRAPHIC set),and then I imported the SVG of that same cup (the Sweet Nothings SVG set). I stacked the two together to make sure that they align and I adjusted them until they are the same size before printing and cutting the layers out. I did waste some ink printing the image 3 times (for cutting out 3 different layers) but I thought it was well worth it considering that I did not waste time trying to pixel trace and creating the layers from that trace. Cutting out was a breeze as I had previously figured out the paper alignment for my Cricut. I took less than 20mins to make this card. In fact, I took a much longer time writing this post up to this point. Having the SVG version of the image makes PNC so much easier especially when the graphic matches and fits within the SVG perfectly as in this case. By the way, the card base was also printed. I used a pattern from the Sweet Nothings Paper Pack and layered the sentiment (also from the Sweet Nothings GRAPHIC set) over it. Even though today's post isn't a full PNC tutorial, I hope that those of you who are already familiar with, or have made your own PNC cards, will find today's tips useful. For today's card, I decided to go back to basics. 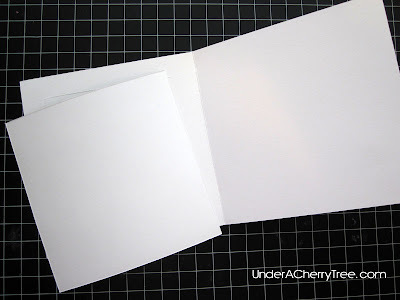 By using some basic colored cardstock (all from Michael's Recollection brand), and a couple of embossing folders, I came up with this easy and super adorable shaped card. I used Make-the-Cut to import the cow and tree from Lettering Delights' Sweet Nothings Gift Card Holders SVG set. 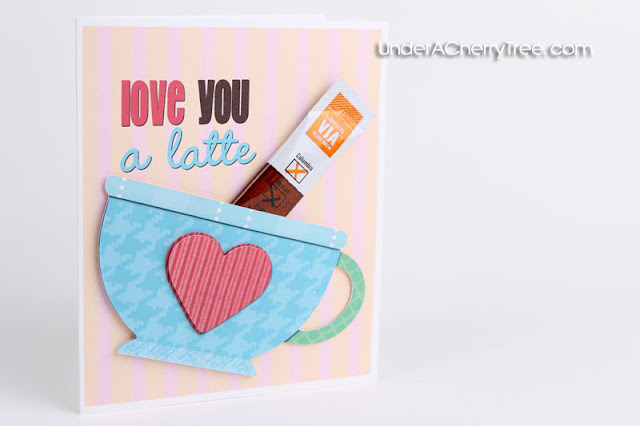 The card base and the 2 layers under the main images were easily made with the Shadow Layer tool in Make-the-Cut. The "COW are you?" stamp is from Joylife's Lots of Puns stamp set. 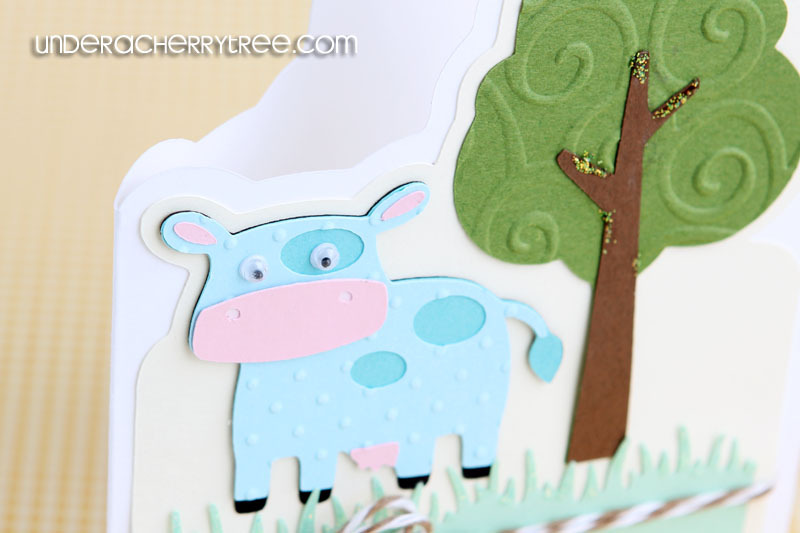 Martha Stewart's grass border punch added a cute accent to the card while a touch of Stickles on the grass tips and tree trunk added bling. 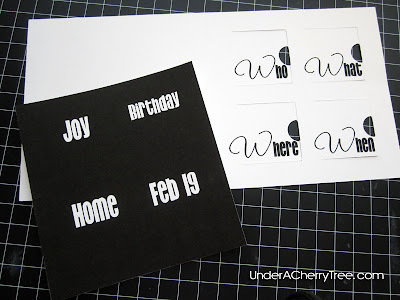 Thanks everyone for joining me in last Saturday's Birthday Party Blog Hop. I hope that you enjoyed looking at everyone's creations and were also inspired to create something too. Congratulations, Amy! I will be contacting you shortly. I have been reading the comments posted on the different discussion boards since posting the message from Doug. Many of you are a little confused with the message and frankly, I don't blame you. When I first read his email, it all went over my head too. Then Doug wrote to me again. This time, in layman's terms, so that my non-technical brain can understand what that was really about. You see, each of the Lettering Delights' SVG file contains these fantastic code that is embedded inside. Just take any one LD SVG that you own and open it in Notepad. See all that code? Yup. There's something beautiful in it. The trouble is, to make good use of these info we really need the programs (like MTC, and SCAL) to be able to harvest it. Currently in MTC, we have to do a "To Each Its Own" when we import a LD SVG in order to separate the layers. Imagine skipping that step and being able to have the program automatically separate the layers of the SVG as soon as it is being imported. I know, I know, it's just saving you a step but still, wouldn't it be cool to skip that one step and be able to dive straight into creating with the SVG? Or imagine having a search feature in SCAL or MTC so that you can easily locate that particular SVG that you have to cut out today. For example, say, you want to find a ladybug cut file from your growing collection of LD SVGs. If that search feature exists, all you need to do is to type in "ladybug" and the program will be able to go through the embedded keywords inside each SVG and retrieve every one that contains "ladybug". That way, you can easily find the SVG you need. Or to have the program retrieve any instructions or comments that are embedded from the SVG file so that you can read the tips or hints associated with that SVG project. Or to read the embedded usage and copyright information. Since Lettering Delights have embedded so much information in each SVG file, they might even be able to embed a raster or bitmap image with the cut lines associated with it. This would be awesome for any future SVGs that are intended for print-and-cut! How cool will it be if MTC is able to retrieve that info too! Several weeks ago, I received an email from Doug Larson, the owner of Inspire Graphics. He wanted me to pass on this message to you but I couldn't figure out an appropriate time to put it out. I realize now that I should have just posted it the very next day. I'm sorry, Doug, that I didn't post this sooner. SVG or Scalable Vector Graphics, are XML based files, meaning that you can open them up in a text program and actually see the “guts.” This is very advantageous in a lot of ways. For one, you can place key words and titles in each of the files. We have actually done this with our files, although the software programs out there do not yet recognize it. My guess is that in the near future, one (if not all) of these programs will notice the embedded information and give the user access to it. This was a bit risky on our part, but we felt that we needed have some vision as to what the trends would be and be at the cutting edge from the get go. The same goes for each of the “layers.” When we create them, the shapes are put into individual layers. However, the programs do not recognize each layer. They only group them together, which is quite different, as you know. At this point, the only way to layer them would be to create them in the native formats of the programs (scal, mtc, etc.) We are confident that the developers of the programs out there will recognize the standard we have set for SVGs and implement access soon. At this point, we are not working directly with any of these companies (but that may change in the future). I would keep your eye open for updates. 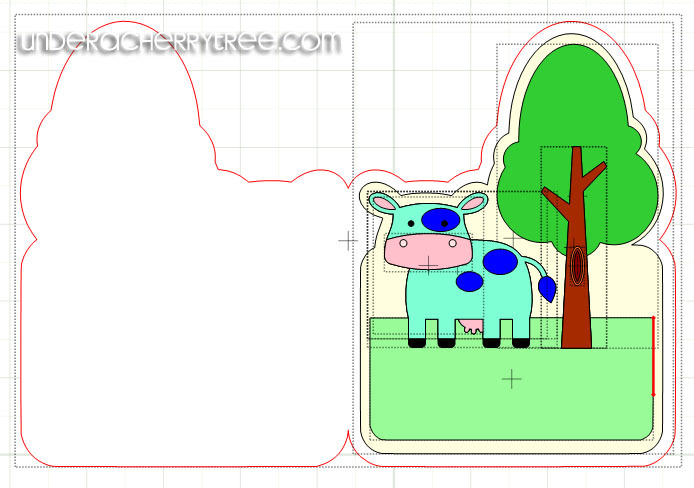 In the meantime, I know that Inkscape is a program that works well with SVG files. It maintains the colors and layering (for the most part). The keywords are of no use here, but it may be something to play with, nonetheless. Happy Monday! Did everyone have fun blog-hopping on Saturday? If you missed the hop, it's not too late to join in the fun. Just click here or scroll down to the post below to start hopping. You can still enter in the giveaways too as the entries are accepted until tomorrow on most blogs. Take a closer look at the last three files. Here are the other sets that were released on Friday. Just click on the image to take a closer look. This giveaway is now closed and entries are no longer accepted. The winner will be announced on Feb 23, 2011. It's here! It's here! Hurray! Blog Hop Day is here! 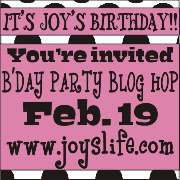 Welcome to the Birthday Party Blog Hop hosted by Joy of Joyslife.com! Do you know that it's really Joy's birthday today? If this is the first time that you are visiting my blog, let me give you a BIG welcome. Feel free to look at my Project Gallery. 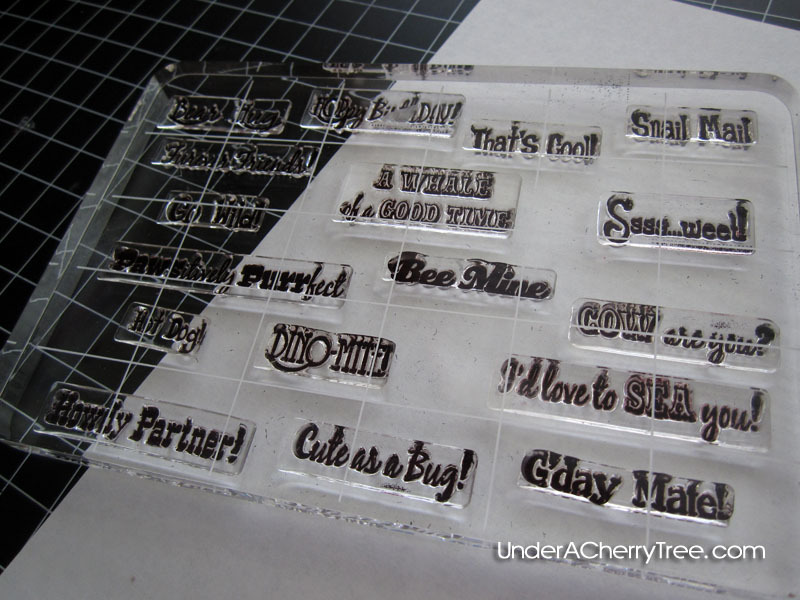 You may notice that I do not use Cricut cartridges for my projects. That's because I am using graphics and SVGs from Lettering Delights with my Make-the-Cut program. All projects on this blog were cut with my Cricut Expression machine. (Note: Provo Craft/Cricut does not endorse the use of any 3rd party software. Cutting or communicating to any Cricut machine with any 3rd party or non-Cricut endorsed software or device will void the warranty of the Cricut cutting machine. As such, it might be prudent to wait until the warranty expires on your Cricut machine before attempting any 3rd party products). Here is the list of blogs who are participating on this hop. Did you come here from Rosy's blog? If not, just click here to start the hop from Joy's blog and keep hopping until you're back here. There are lots of inspiration and blog candy to get along the way and you don't want to miss any of the fun stuff. In case you get lost hopping, just come back here and refer back to the list below to get back on track. Now don't you think that this card is just too much fun? I chose to use black and white because that's how honest Joy is when she reviews products. She either loves it (and tells you so) or dislikes it (and threatens to throw the product out the window!). You can't be more honest than Black and White. The addition of the twine brings a pop of color. 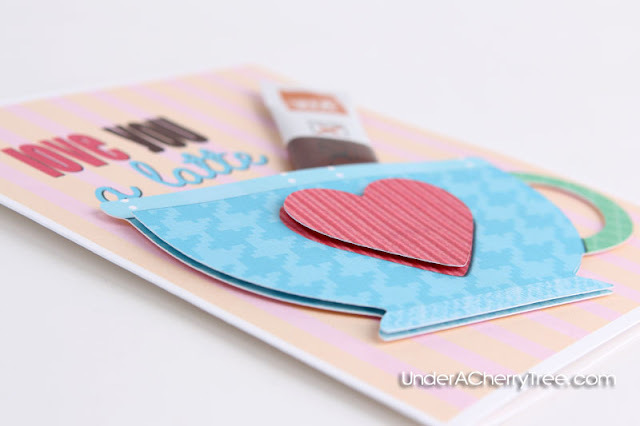 To make this card, I used Lettering Delights' Sweet Nothings SVG set. The cut is the last file in the set. I cut it out with Make-the-Cut and the Cricut and printed out the words on the four panels using the technique shown HERE. The words behind the windows were printed on a square the size of the card front. I adhered that square behind the card front so that the words sat behind the windows and will only be revealed when they were opened. Tie a piece of colored twine around the card and the invitation is done! 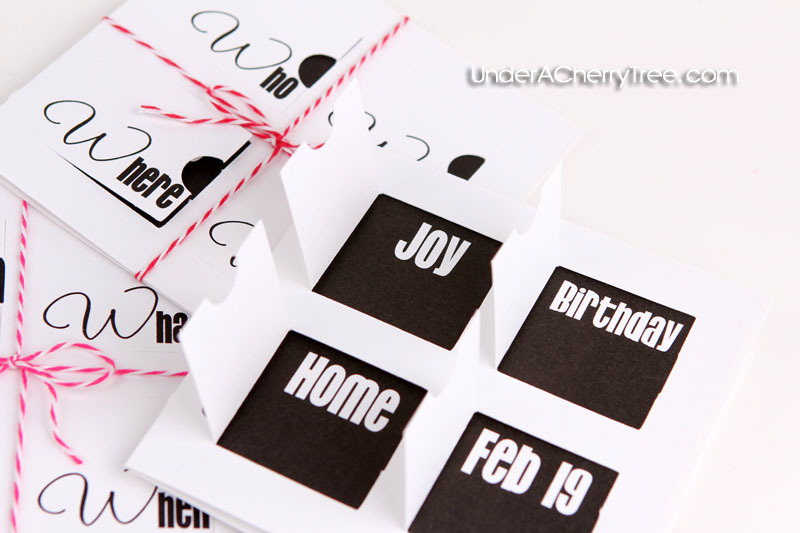 If invitations are the first things to a party, then the last thing has got to be the party favor. 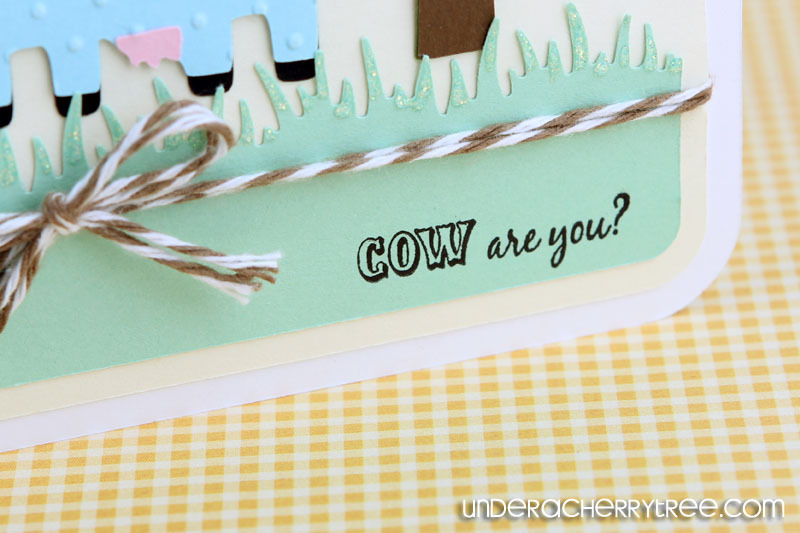 I cut out the box from Lettering Delights' Animal Boxes and Bags SVG set and used Joy's Lots of Pun stamps to decorate it. The gift topper is a flower that is made using a brand new Lettering Delight's SVG set that will be coming soon. Isn't it the most stunning cutout you have ever seen? I can't wait until this set is released so that you can use your Cricut to make a flower just like this! That's right! 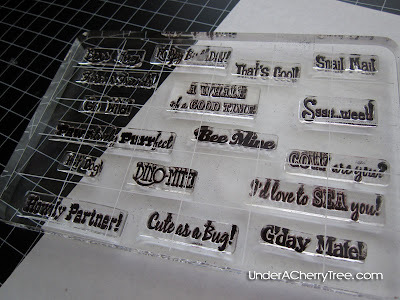 She's giving away a All Around Sentiments Stamps set!! Thank you, Joy! Entries to the giveaway will be accepted from now until Tuesday Feb 22, 11:59pm PST. The winner will be chosen by RANDOM.ORG and announced on Wednesday February 23, 2011. If you're ready to continue on your hop, your next stop is Melissa's Moe Creations. 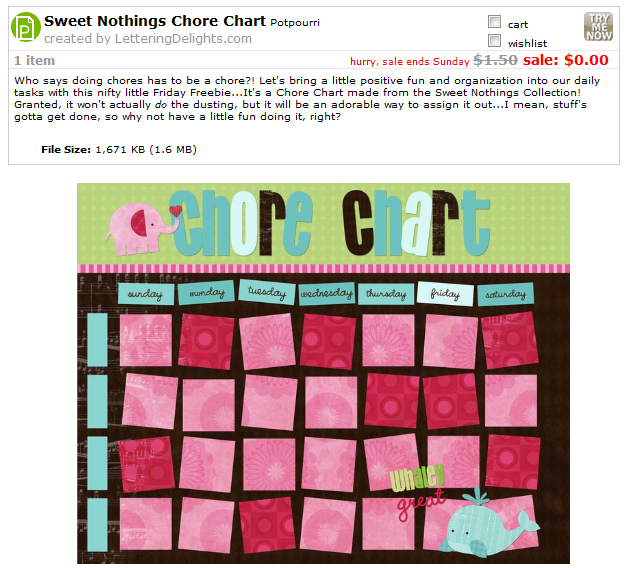 LD Friday Freebie: Sweet Nothings Chore Chart! Here's another darling freebie from Lettering Delights. Just click here or the image below to add the freebie to your cart. Check out and pay $0! I'd love to SEA you! 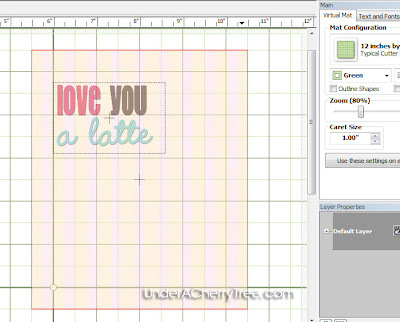 LD Sneak Peek: Playtime Graphics and SVGs! Winners!- "How Many Owls" LD GC Giveaway! 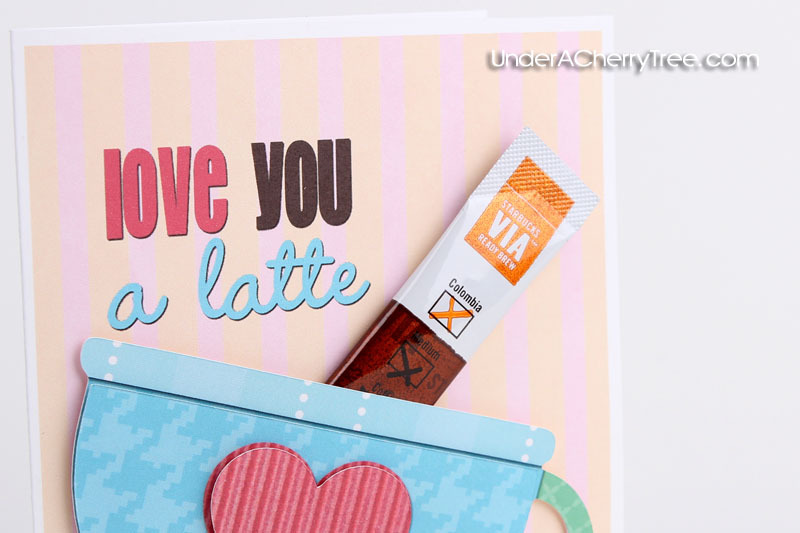 Valentine Treats: I'm Stuck on You! It's a Valentine's Day Parrrrty!